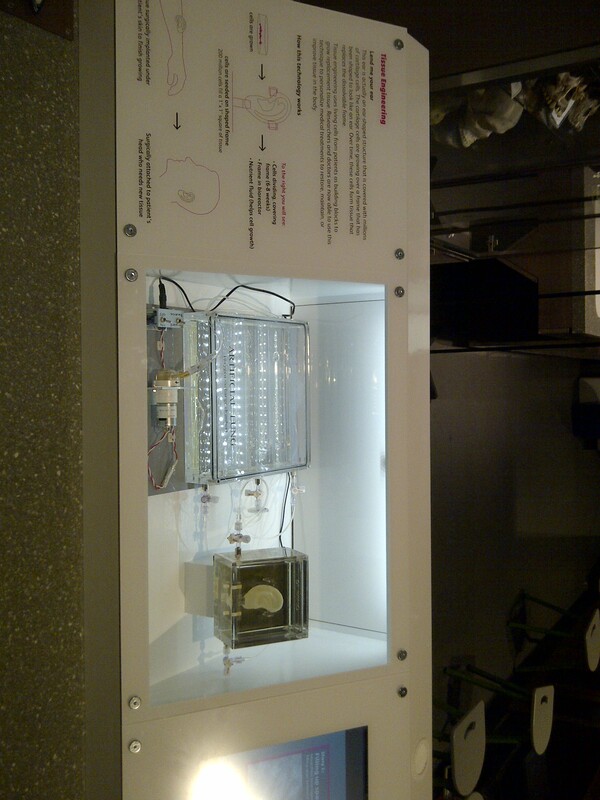 Charles Vacanti’s museum exhibit features a transparent bioreactor (above, at left) and a growing human ear (at right). Complex, mysterious and fascinating, the human body now has its own permanent exhibit at the Museum of Science, and BWH’s Charles Vacanti, MD, is the creative force behind one of the exhibit’s features. Open to the public as of Nov. 17, the Hall of Human Life explores such topical issues as DNA sequencing and social and environmental impacts on health, through 70 interactive components. Visitors can test their balance, measure the size of their ears, learn about the efficiency of their walk and discover and record a host of other personalized health information as they make their way through the exhibit. Vacanti’s contribution is a live tissue engineering demonstration composed of a transparent bioreactor and ear-shaped scaffolding that contains millions of living cartilage cells. The bioreactor functions like a human lung, circulatory system and tissue chamber, mimicking the environment inside the body that allows cells to grow and make new tissue. It exchanges oxygen and nutrients provided to the ear structure, allowing cartilage cells to mature and form tissue. The scaffolding itself eventually breaks down, resulting in a living human ear. Vacanti had been working with his lab’s scientific director Koji Kojima, MD, PhD, MHA, a thoracic surgeon, to build a model of the bioreactor and have the mock up manufactured. “I assumed we would never hear from the museum,” said Vacanti. But he received a response just a couple weeks later; the museum was excited to adapt and showcase his concept. Two years later and the exhibit is alive and well in the museum’s busy hall. Vacanti hopes that after fully growing an ear a few times, he’ll be able to grow a human windpipe or trachea. A longer-term goal, possibly one or two years away, is growing heart cells that would initially beat individually, and eventually connect with each other and contract in unison-a demonstration that has not yet been accomplished. As tissue engineering advances, the applications for growing new tissue could be unlimited, Vacanti says. “I’m proud of the exhibit for several reasons, especially that it comes from the Department of Anesthesiology and BWH, which is one of the most innovative and supportive environments in which an academic physician can work,” he said.